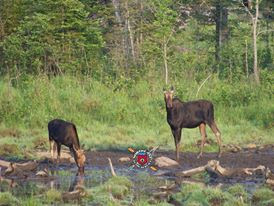 Show me an example Maine Moose Tracks - Greenville Maine Moose Watching Tours: Moosin' Around The Moosehead Lake Region! Two Of The NINE MOOSE We Saw! Oh deer! It's getting pretty wild on our Daily Moose Safaris. This one married couple may not have brought the sunshine but they certainly brought us some luck with seeing our fantastic Maine wildlife! 3 moose, 1 cow, 2 yearling, 2 hare, and a whopping 5 deer! They saw the moose just hanging out in the bogs and some walking around in the roads, so be extra careful driving out there! On one of our peaceful Private Moose Tours we came across 4 moose, 3 cows, 1 deer, 1 eagle, 1 hare, and 1 fox. It was a great chance to see what we have to offer in the Moosehead Lake Region! One thing that excited them in particular was seeing the 3 cows...one of which was a brand new Mamma! And who doesn't love baby moose? What a trip! 4 people made up this adventure seeking group. They day was filled with blue skies and that sunshine we love so much! What was super exciting about this tour was that we made a new personal record for moose sightings! 9 MOOSE total! Along with the moose we saw a grand total of 8 deer, 4 cows, 4 yearling, and my personal favorite 2 loons or love birds, as I like to call them! It really was a gripping adventure!